Cards That Never Were is a recurring series in which I create virtual cards for players who were missed in various sets. It is a concept I have borrowed from too many to list, but I appreciate all of them. 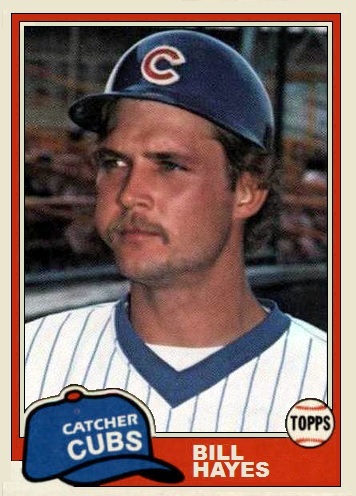 In 1980, the Chicago Cubs used five players at catcher. The most games were started by Tim Blackwell (93) and Barry Foote (52). Mike O'Berry started 15 games and Bill Hayes started 2. Cliff Johnson did not get any starts behind the plate, but he saw some catching action in one game. Blackwell and Foote had cards in the Topps 1981 set. Johnson also had a card, but was listed at 1st Base, where he started 44 games. Hayes appeared in one game for the 1981 Cubs and did not get a Topps card in 1982. I decided to fill in the missing card in the 1981 set. For Hayes, his one 1981 game (with no plate appearances) and lack of good pictures, helped me decide not to try a 1982 card (yet).